Over the last two years, fifteen-year-old Flavia Bujor became a media sensation around the world with her much-heralded fantasy debut, The Prophecy of theStones. The novel was published in more than twenty-one countries, and Flavia appeared in countless magazines and on television programs including The Today Show. 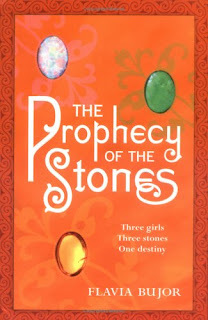 The Prophecy of the Stones tells the story of three teenage girls-Jade, Opal, and Amber-who are chosen to fulfill an ancient prophecy. Although strangers, they must learn to trust one another with their lives as they embark on an epic journey, armed only with magical stones. They must leave their families and friends to battle fierce enemies in a magical land called Fairytale, where evil is unknown.In a parallel world, a young girl named Joa fights for her life in a hospital in Paris. While she is dreaming, she is transported to a magical realm where the three young heroines fight a spectacular battle. Their success or failure will determine the fate of Fairytale . . . and Joa's survival. The novel started out a little childish, and that sense of youth never really left the novel. All three of the girls are on the eve of turning 14 when the book starts out, so right off the bat you know it’s not going to be anything super teenager-ish. The writing itself is sub-par to what I mostly read. But I could deal with it because, as I’m learning French, I realize that not everything translates exactly as it would normally be in the original language. Actually, I want to get the novel in French and take a crack at it. Still, as I got more into the book, I could overlook the writing and focus more on the plotline. It was cute, but “campy” as the friend who let me borrow it said. The Prophecy of the Stones was a highly entertaining read, although I know a lot of people wouldn’t like it. This is definitely not YA, more of a Middle Grade, better for 9-13 year olds. Not one of my favorites, but it was good. Add Prophecy of the Stones on Goodreads and Shelfari. I read this book when I was much younger, and while it wasn't my cup of tea (at all) I do applaud the author for getting a book written and published at such a young age! Huh. I love young writers, I'm trying to be one myself, but I have to admit I haven't enjoyed many books I've read by young writers. Also, not a comment on the quality of any of the works, but why do ERAGON, THE FIRE STONE, and THE PROPHECY OF THE STONES (all by young authors) feature prophecies/fate prominently? Just an observation. I'd actually never heard of this one, so thanks for putting on my radar, even if I'm pretty sure I'll skip it.